PHOTO: Neil Stephan ”The Reverend” DeArmon and Smoke BBQ owner Roland Feldman at the restaurant’s Mount Pleasant location; for now, patrons can find the duo’s cornbread at Smoke’s King Street outpost. Just over a year ago, Neil Stephan “The Reverend” DeArmon was a Coast Guard veteran without a home or a job, living on the street. Today, thanks to culinary training at One80 Place and a chance encounter at Charleston Wine + Food, he’s sous chef at Smoke BBQ and the face and co-owner of a burgeoning cornbread company. The Reverend (or “Rev,” as he’s known around Smoke) started in the washing station, though, “We don’t call them ‘dishwashers,’” Feldman notes. “We call them ‘stewards’—it adds respect.” Within just a few months, the new recruit was promoted to assistant kitchen manager. PHOTO: Director of operations Angela DuPree (at left) heads up One80 Place’s training program. In the last year, 95 percent of its graduates have been placed in permanent F&B jobs. Soon, the duo, now partners in the forthcoming Reverend Cornbread Co., was setting up shop at Second Sunday, the Charleston Bridal Show, and all of Smoke’s catering gigs, slinging muffins to the masses. With packaging and a business plan in the works, The Reverend can’t believe his luck. “I still think to myself, ‘No way. This isn’t happening,’” he says. When asked about his goals, the sous chef is humble. “Right now, my focus is just learning the business and working with charity,” he says. “Because when you’ve been down and you come up from it, you look for ways to give back.” As often as he can, DeArmon returns to One80 Place to serve meals and speak to current students in the training program. And that’s not all that’s come full circle—this year, proceeds from CW+F will benefit the very shelter that got The Rev back on his feet. 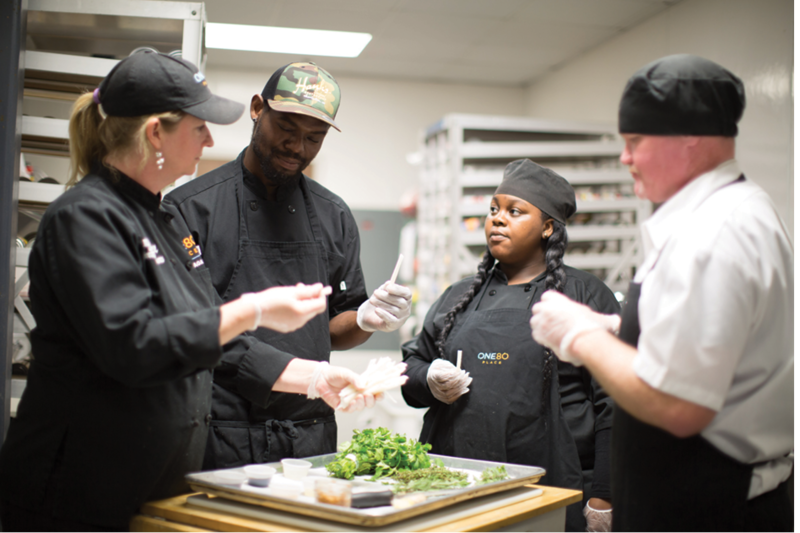 See One80 Place culinary training director Angela Dupree speak at the festival’s Pecha Kucha event on Friday, March 2, and catch the Smoke team at “Toasted” this year on Sunday, March 4, at 6 p.m.